DC JOBS WITH JUSTICE APPLAUDS ATTORNEY GENERAL FOR GROUNDBREAKING SUIT AGAINST POWER DESIGN, INC.
Washington, DC – Yesterday, the DC Office of Attorney General brought suit against Power Design, Inc. (Power Design) and two subcontractors for stealing wages from over 500 workers in Washington, DC. (Read full complaint.) DC Jobs With Justice applauds the OAG for their work heeding the calls of community groups to investigate Power Design, which has a history of noncompliance with labor laws in the region and around the country. DC Jobs With Justice, in collaboration with community groups and labor unions, advocates for better enforcement of DC’s labor laws including sick and safe days, minimum wage, misclassification and overtime. The suit brought by OAG accuses Power Design of violations in each of these areas as well as failure to pay local taxes. 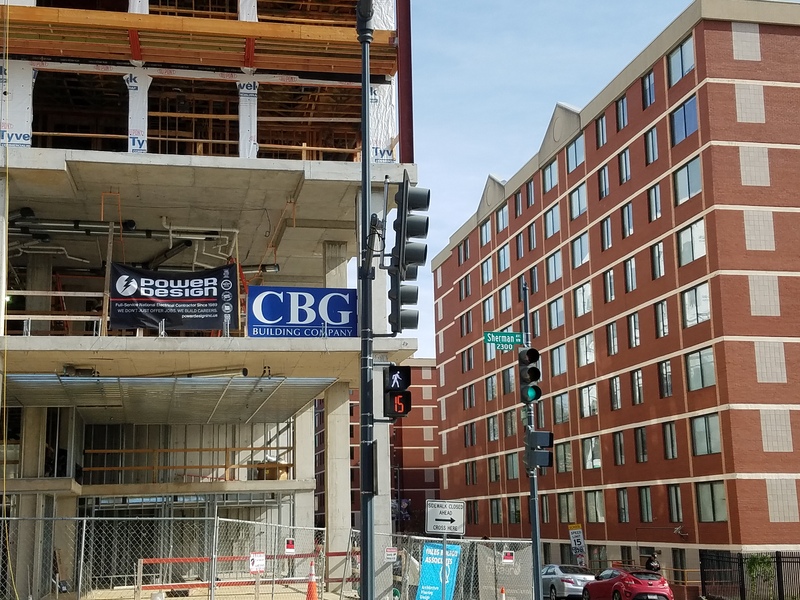 DC Jobs With Justice highlighted concerns about Power Design’s labor practices with a rally at the controversial Line Hotel development which received a large tax break, and at the many sites near Nationals Park on May Day (May 1, 2018). Making Our Laws Real, published by DC Jobs With Justice and the Just Pay Coalition this year, recommends that enforcement agencies like OAG target high profile cases which can have an impact across a key industry, that they utilize joint liability, and that they publicize such cases. The suit against Power Design does just that. Construction is one of the five areas that the DC Department of Employment Services identifies as high risk for wage violations. DC’s labor community, advocacy organizations, and government have worked hard over the last few years to end the practice of wage theft. In 2014, the City Council unanimously passed the 2014 Wage Theft Prevention Amendment Act. Subsequent efforts worked to clarify the law and to ensure its robust enforcement via increased funding for the Department of Employment Services Office of Wage-Hour. 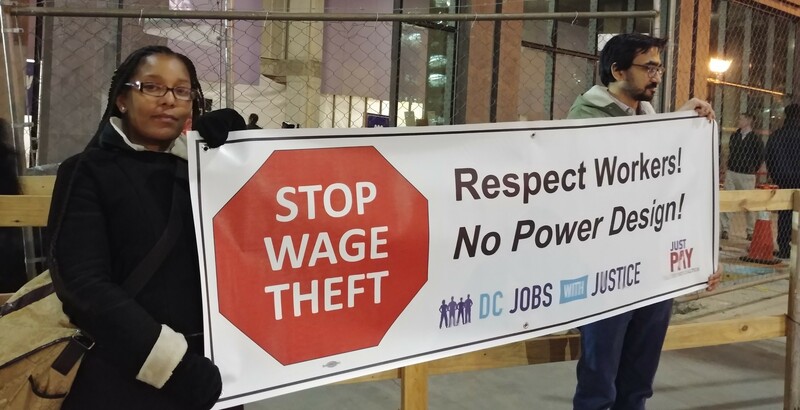 Despite this, wage theft remains pervasive in the District of Columbia; far too many companies still fail to pay workers the minimum wage, fail to pay due overtime pay, fail to pay workers on time at their promised wage, and fail to properly classify employees as employees instead of independent contractors. As part of the Just Pay Campaign, DC Jobs with Justice is working to end wage theft by educating community members on what wage theft is and how to address it, continuing to work to improve policy and implementation and leading the campaign to highlight enforcement failures by taking on bad actors. failure to properly classify workers as employees instead of independent contractors. The DC Just Pay Coalition has released a new report which recommends a focus on strategic enforcement to turn the tide on wage theft in Washington, DC. Read the report here. Bad Actor: Power Design, Inc.
Power Design has been sued numerous times for violations of the Fair Labor Standards Act, both here in D.C. and around the country. The pattern of violations alleged in those lawsuits and found by organizers here on the ground suggest that Power Design utilizes a business model of undercutting its competition by misclassifying employees, stealing wages, and exploiting low-paid workers. Power Design relies on unlicensed labor brokers and misclassified workers to perform everything but the managerial duties on a worksite. Even though the company outfits workers in Power Design equipment, directs their work, and disciplines them, workers on Power Design job sites are misclassified as independent contractors and paid in cash or personal check by the labor broker. These practices are well documented in lawsuits from both DC and nationally. This is an apparent violation of the D.C. Workplace Fraud Act (2013) which dictates that a worker may only be classified as an independent contractor if they completely control how they perform the services and the entity who has hired them only specifies the end result, the worker is in an “an independently established trade,” and “the work is outside of the usual course of business of the employer for whom the work is performed.” Through this scheme, Power Design can avoid federal and local taxes, unemployment insurance taxes, workers compensation insurance, and other labor laws, and outsource their liability. Worker, many of whom do not have papers, speak fluent English, or know their rights under labor law, are lacking in protections and rights that they would otherwise have. In turn, general contractors and developers have come to rely on Power Design’s artificially low bids and thus entrenched this “race-to-the-bottom” strategy by awarding Power Design plum contracts on projects throughout the District. Research into Power Design, Inc revealed at least 13 lawsuits against the company for wage theft. In the six cases where the settlements are recorded in the courts Power Design, Inc and its co-defendants paid approximately $701,148 to plaintiffs, including $184,726 representing unpaid wages. In Washington, DC, two wage theft lawsuits have been filed, both involving multiple plaintiffs. In 2016, Isaac Bonilla filed a lawsuit on behalf of himself and approximately 15 other electricians alleging that they were not paid for all hours worked at least at minimum wage or overtime pay while regularly working 48 hours a week at a George Washington University project [See Box below]. This case was settled for a total of $25,000. In Rivera et al v. Power Design, Inc. et al, 5 plaintiffs allege on behalf of themselves as well as other similarly situated workers, that there they were not paid the D.C. or federal minimum wage or overtime for approximately one month for work at a condominium development project at 460 New York Avenue NW. This case was settled for $35,000 with each worker receiving between $600 and $3600 for their claims of unpaid wages. Bonilla In 2016, Isaac Bonilla filed a lawsuit on behalf of himself and approximately 15 other electricians against Power Design, Inc. (“Power Design”), DDK Electric, Inc. (“DDK”), and Clark Construction. Bonilla alleged that while doing electrical work at 2121 H St NW, a George Washington University student housing building, he and other electricians were working 48 hours per week. They allege they were not paid for all hours worked and did not receive an overtime premium for hours worked over forty (40) in each workweek and were misclassified as independent contractors. Mr. Bonilla filed claims under the Fair Labor Standards Act, the D.C. Minimum Wage Act Revision Act, the D.C. Wage Payment and Collection Law, the D.C. Wage Theft Prevention Amendment Act, and the D.C. Workplace Fraud Act. In the lawsuit, Bonilla makes a case that he and other electricians should be considered joint employees of Power Design and DDK Electric. They state that an employee of Power Design directs the electricians work and has the power to hire and fire electricians, to correct work, and sets the time for breaks and beginning and ending the work day. He also states that Power Design provides the electricians’ tools, other than hand tools, equipment, and hard hats. Power Design also provided the electricians’ time sheets which read “Power Design Installation Team Hourly Sign-In Sheet.” They state that an employee from DDK, an unlicensed labor broker, recruited the workers and serves as a pass-through for wages by providing paychecks to the employees with no withholdings. In a Memorandum Opinion and Order, a Judge held that Bonilla had adequately alleged that Clark Construction is vicariously liable under two D.C. statutes for wage violations by Power Design and DDK Electric. This case was settled in September of 2016. Bonilla and the other workers received $8750 to settle their claim for back wages plus an additional $8750 for “liquidated damages” and $7500 in attorney plaintiff’s attorney fees. Design has, unfortunately, been given the green light by D.C. developers and even D.C. government to continue its current business practices. Power Design, Inc. has numerous large projects in the District and received certification for its apprenticeship program in June. Alerted of the company’s track-record and apparent business model, Attorney General Karl multiple times notified the DOES leadership of concerns. Despite this and the company’s history of lawsuits regarding wage theft, the D.C. Apprenticeship Council, a regulatory board comprised of 11 members appointed by the Mayor and confirmed by the DC City Council, approved Power Design’s apprenticeship program. This opens the doors for the company to bid on and inevitably win tens of millions of dollars of publicly-funded work. Ariel Ladima from Puerto Rico lives in Clinton, Maryland. He worked directly for Power Design as as an electrician for one year. Ariel made $30/hour and stresses that he personally was never treated poorly but that he saw firsthand the company’s scheme of using under-trained and exploited workers hired by labor brokers to do electrical work. At Power Design, Ariel worked on Howard University’s Sherman Avenue Apartment development and a dormitory for George Washington University. An experienced electrician, he would direct roughly 10 workers hired through a labor broker with guidance from a Power Design foreman. At the Sherman Avenue Apartments, Ariel and the foreman were the only two Power Design direct employees on the entire project. Ariel estimated that only 30 percent of the workers were prepared or trained enough to do the job well. The labor broker’s workers made between $10 and $16 per hour, said Ariel, and they were paid either in personal checks or in cash. All were misclassified as 1099 independent contractors and their timesheets were labeled with Power Design’s insignia. All the subcontracted workers were Latino, Spanish-speaking, and they were treated disdainfully by their labor broker. “I can testify to that,” Ariel said. “It’s just ‘push, push, push’ all day.” If a worker got hurt on the job, he would be sent to urgent care. The urgent care bill would be paid by the labor broker, but that worker would be fired. Carlos Oliva is a father of two, grew up in the Mt. Pleasant neighborhood of Washington, D.C., and has been an electrician for 18 years. He has been a union electrician for 17 of those years, but when work was hard to come by last year, he took a job with Power Design, Inc. in November 2016. Since Carlos was an experienced union electrician, Power Design hired him directly to oversee its subcontractors. He worked on a project at George Washington University where Power Design had been contracted to do the electrical work on a new dormitory for students. Carlos was paid well as a foreman for Power Design, but could not help but notice the vastly different treatment of those employed by Power Design’s labor brokers. These workers hired through labor brokers were unprepared and untrained for the electrical work they were assigned, so Carlos had to carefully supervise them and help fix their mistakes. And though they wore Power Design uniforms, used Power Design tools, and were directed by Power Design employees like Carlos, these workers were not Power Design employees. They were paid by fly-by-night companies, sometimes as 1099 contractors. Get in Touch! Help pass a resolution: We’re working with ANCs and Universities to pass resolutions opposing Power Design and supporting aggressive oversight at all levels of redevelopment projects. Take Action! Come out to Actions! Sign up to be part of DC Jobs with Justice Solidarity Squad!